Irish-English writer and playwright whose literary works include the novel The Vicar of Wakefield (1766) and the play She Stoops to Conquer (1773). His eight volumes of A History of the Earth and Animated Nature (1774) was not a work of scholarship, but used natural history information from others, which he rewrote as popular science reading. The series was reprinted in over twenty editions for decades after his death. 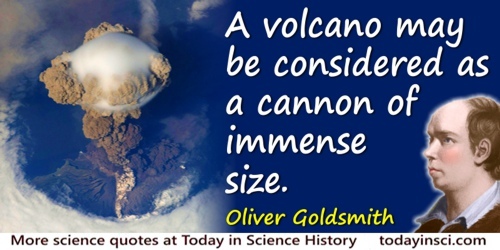 A volcano may be considered as a cannon of immense size. In A History of the Earth and Animated Nature (New ed. 1805), Vol. 1, 77. 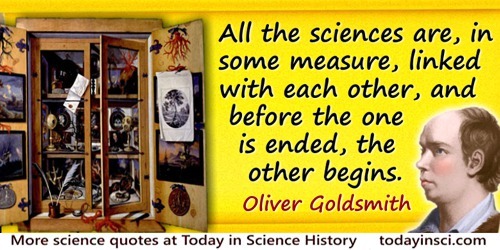 All the sciences are, in some measure, linked with each other, and before the one is ended, the other begins. In History of the Earth and Animated Nature (1774, 1847), Vol. 1, 65. The Deserted Village: A Poem (1809), 11. As few subjects are more interesting to society, so few have been more frequently written upon than the education of youth. Essay No. VI, 'On Education', first published in The Bee (10 Nov 1759), collected in The Works of Oliver Goldsmith (1900), Vol. 5, 95. Reprinted as Essay VII under the title 'On the Education of Youth', (1765). The Bee was a weekly paper wholly the work of Goldsmith. If we look round the world, there seem to be not above six distinct varieties in the human species, each of which is strongly marked, and speaks the kind seldom to have mixed with any other. But there is nothing in the shape, nothing in the faculties, that shows their coming from different originals; and the varieties of climate, of nourishment, and custom, are sufficient to produce every change. In History of the Earth and Animated Nature (1774, 1812), Vol. 2, 154. If you were to make little fishes talk, they would talk like whales. Commenting how the animals in fables should talk in character. As quoted in James Boswell, The Life of Johnson (1785), 229. But let them prove it if they can. 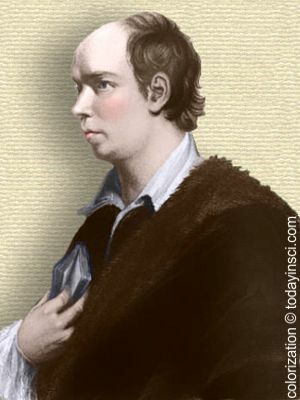 In 'The Logicians Refuted', The Poems and Plays of Oliver Goldsmith (1818), 58. Whatever the skill of any country may be in the sciences, it is from its excellence in polite learning alone that it must expect a character from posterity. Essays, on Miscellaneous Subjects (1818), 198. When we take a slight survey of the surface of our globe a thousand objects offer themselves which, though long known, yet still demand our curiosity. In History of the Earth and Animated Nature (1774, 1847), Vol. 1, 67. [T]here are depths of thousands of miles which are hidden from our inquiry. 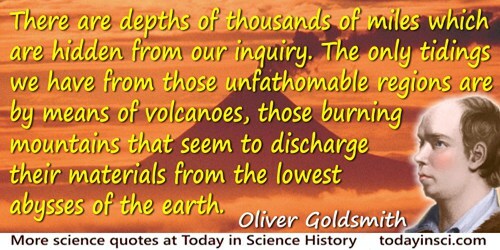 The only tidings we have from those unfathomable regions are by means of volcanoes, those burning mountains that seem to discharge their materials from the lowest abysses of the earth. In History of the Earth and Animated Nature (1774, 1847), Vol. 1, 92. Goldsmith: If you put a tub full of blood into a stable, the horses are like to go mad. 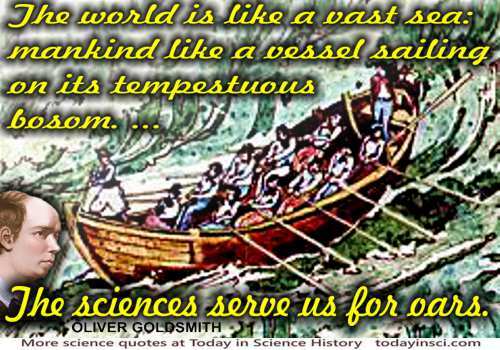 Goldsmith: Nay, sir, it is a fact well authenticated. Thrale: You had better prove it before you put it into your book on natural history. You may do it in my stable if you will. Johnson: Nay, sir, I would not have him prove it. If he is content to take his information from others, he may get through his book with little trouble, and without much endangering his reputation. But if he makes experiments for so comprehensive a book as his, there would be no end to them; his erroneous assertions would then fall upon himself: and he might be blamed for not having made experiments as to every particular. In James Boswell, The Life of Samuel Johnson, LL.D. : Comprehending an Account of His Studies and Numerous Works (1785, 1830), 229-230.